People are tired of standard white characters doing much of the same things they’ve done in comics and other art mediums for centuries. Thus, having Ta-Nehisi Coates—a brilliant writer and thought-leader in the black community—take the reins of the sophisticated and intricate black superhero Black Panther is an inspired choice. He brings sharp and deeply intelligent insight to a world that has seen a rise of racism, and yet is still clamoring for more diversity in the arts. The end result neither meets the hype of the project nor flops as it certainly could have. The language Coates uses is beautiful, and he excels when he’s writing about the moments where T’Challa wrestles with what it means to be both a super hero and king to the fictional country Wakanda that is in deep turmoil. 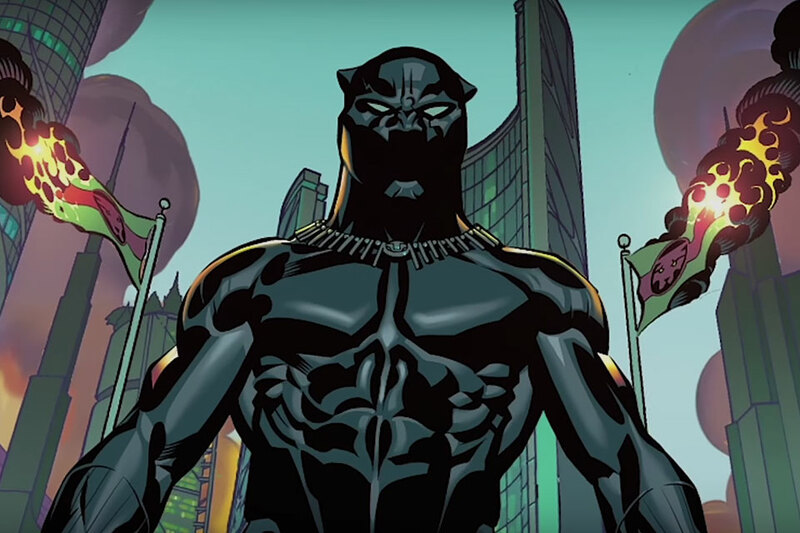 Wakanda is very much based on Africa, but Coates depicts it through a hopeful lens, showing the country as the most advanced technological entity in the world. Much like the precious metals that the world depends on from its real life inspiration, Wakanda’s claim to fame is “Vibranium” a rare fictional metal that Marvel has often used as a deus ex machina in the same way they’ve gone to magic time and again. It’s as important to Wakanda as the people’s namesake and culture. This is Coates playground to envision the world as it is in real life and how it could look in the future. He explores the old meeting the new and what that looks like for the average citizen still steeped in archaic rituals and mores. What’s interesting is the very plausible possibility that conflict would still continue even amongst incredible enlightenment. Where A Nation Under Our Feet falters is in its action and execution of plot. At times, a reader wouldn’t be remiss to think they skipped a page when an action sequence pops up. Sometimes it is so abrupt, it’s as if Coates wants to get some of the fights over so that he can get back to the more intellectual stuff at hand. As much as I’m interested in Coates philosophy, there should be some payoff to go with all of the setup, especially given that very little backstory is provided to explain what’s going on in T’Challa’s world as it begins with Coates run. With so many great design details and artwork by Brian Stelfreeze, it’s frustrating to not see it more in action. It goes without saying that any physical conflict remains stifled and unresolved, leaving any payoff coming from introspection and the advancement of the Wakandan civilization. While the graphic novel is a short read, stuffed with an old Black Panther comic to pad for length, this is still something that all fans of good and promising comics should read. Coates is just getting started, and he will only get better as he learns to write for comics, and his pedigree as an author bring so many new possibilities to a character and fictional country that could border on stereotypical to nonsensical. This is a series to watch.